Veerle and I trying to protect ourselves from the mosquitos. My name is Britte Heijink and I’m doing my MSc Biological Science thesis research project with Crystal McMichael and William Gosling. I travelled with Veerle Vink and Crystal to the Colombian part of Amazonia to collect samples for my project. 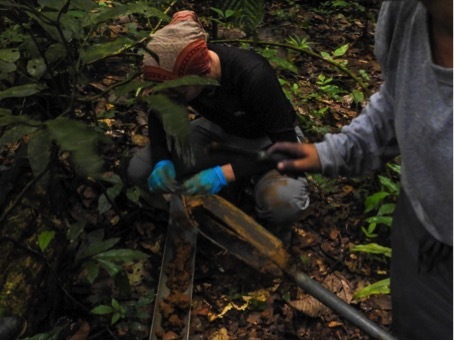 At Amacayacu National Park, we collected soil cores from different locations in the plot. Now that we’re back in Amsterdam, I’m analysing the soils to reconstruct the fire and vegetation history from the plot using charcoal and phytoliths. I am specifically looking to see if humans have been present in the system and how they potentially affected the vegetation at Amacayacu. I’ve completed my bachelor thesis for Bèta-Gamma (Liberal Arts and Sciences) under the supervision of Crystal and Will here at the UvA. I’m really excited to work with them again, and already looking forward to our meetings at the Oerknal 😉 I will be finished by the end of September, and then possibly return for a literature study. 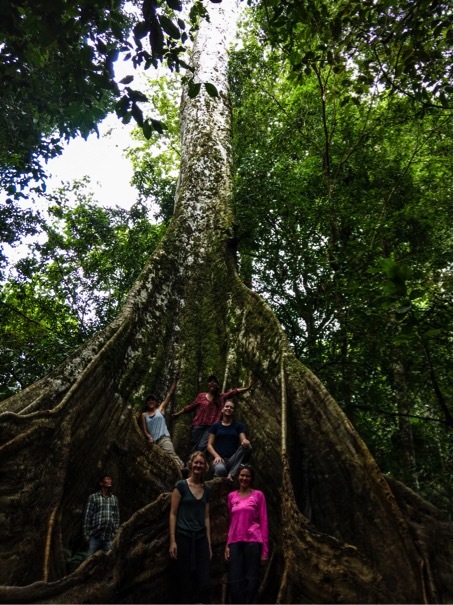 One of the most wonderful experiences in my academic career so far has been the fieldwork to Panama and Colombia with Crystal, Veerle, and Nina. 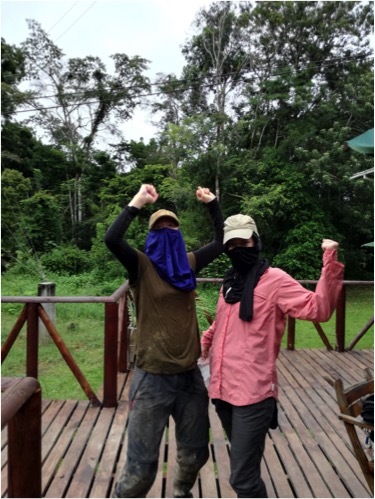 It was a lot of hard work, and 90% of our time was spent covered in mud, sweat, and insect repellant, but the experience of working in a tropical rainforest was completely worth it! Veerle and I will write another blog about our fieldwork soon. Come see us in the microscope lab if you want to hear our dangerous and amazing stories before that! Our last day in the Amazon was spend with some of the local students, Louisa Fernando Gomez Correa and Mariana Gutierrez Munera.